This tutorial will help you re-code your data based on a reference coding table in Excel using the XLSTAT software. Once you've clicked on the relevant button, the dialog box appears. Select the variable you wish to recode. 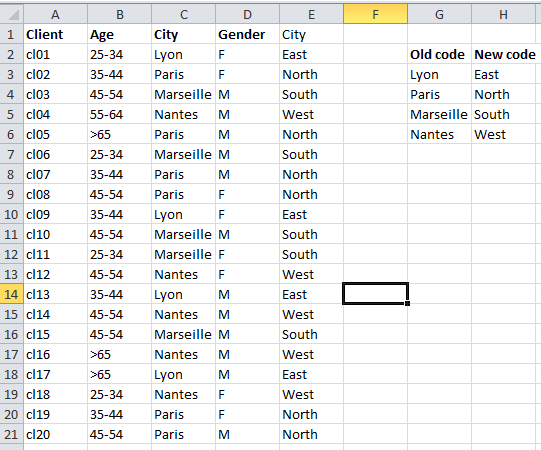 Here we choose the variable "City" by selecting the whole column. Then select the coding table that contains both the old values and new values. Note that you should include the heading in the selection. When ready click on the OK button. The results will now be displayed next to the table. You can verify that the code has been properly used. This video shows you how to proceed with this tutorial.